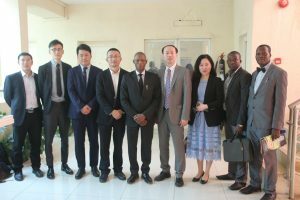 Director General of National Automotive Design and Development Council, (NADDC), Mr. Jelani Aliyu, MFR, today Monday March 25, 2019 in Abuja received in audience visiting investors from Cherry Automotive Manufacturing Plant, China. The visitors came to express their intent to set up a vehicle assembly plant in Nigeria under the auspices of the Nigerian Automotive Industry Development Plan (NAIDP). Picture shows the NADDC boss in the center, flanked by investors from Cherry Autos, China.